JSON paths: Directories to search for *.json files to find symbol definitions. Resource includes: include paths to pass to the resource compiler when building resource files. Install path: The path to the compiler installation folder you entered within the installer. 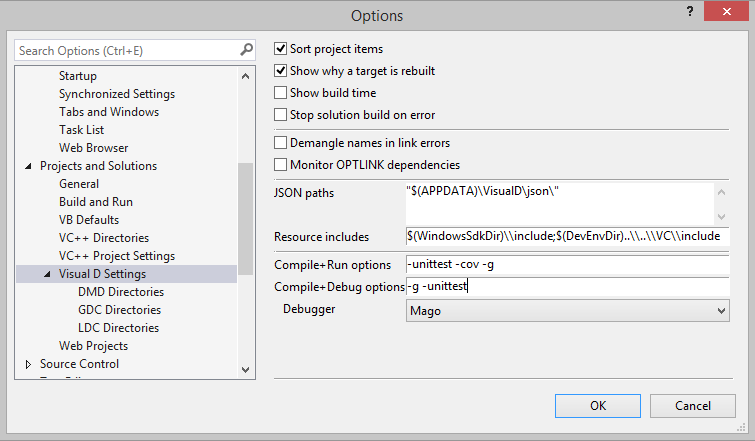 Import paths: Directories to be added to the import paths specified in the project configuration and in the DMD configuration file (also used for import statement completion and finding symbol definition). Executable paths: Directories to be added to the PATH environment variable before executing build commands. Library paths: Directories to be added to the LIB environment variable before executing build commands. Executable and library search paths are given depending on the target architecture. 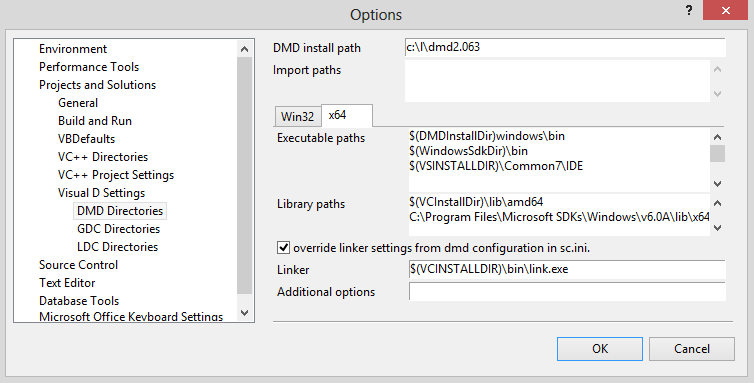 When using DMD for Win64, options from its configuration file can be overwritten by specifying the linker to be used and additional options. The latest Windows installer for DMD modifies the default sc.ini by expanding variables according to the most recent Visual C++ installation and Windows SDK installation directories. This is necessary to allow building Win64 executables from the command line without having additional environment variables set. Unfortunately this makes it difficult to use libraries from the current Visual C++ installation if you have multiple Visaul Studio versions installed. Enabling this option allows to override the linker settings from sc.ini. At the same time the library search paths are added to the command line. Also note that using a 32-bit linker executable is necessary to monitor link dependencies. $(DMDINSTALLDIR): DMD Install path from the "DMD directories page"
$(DMDINSTALLDIR): GDC Install path from the "GDC directories page"
$(DMDINSTALLDIR): LDC Install path from the "LDC directories page"
Please note that you'll also find a new entry "D" in the Text Editor branch to setup syntax highlighting and more.